The Arsenal manager met with the club’s owner Stan Kroenke over his future yesterday. The pair in happier times. 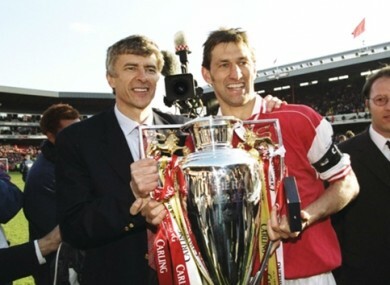 ARSENE WENGER HAS “total dominance” at Arsenal but would not have lasted a year at Real Madrid, according to Tony Adams. The Frenchman has seen his position at the Gunners helm called into question on a regular basis this season, as his current contract runs down. No fresh terms have been put in place as yet, but the Arsenal board are expected to shun calls for change and favour stability at Emirates Stadium. Wenger has aired his commitment to the cause on the regular basis, admitting at one stage that he has shunned offers from the biggest clubs in world football to stay in north London, but Adams claims he is only in that position because Arsenal have given him “free rein”. The former Gunners captain told the Guardian: “He said: ‘I’ve turned down every club in the world’. But he would’ve been sacked after a year at Madrid. He would’ve had to go to from club to club. “But, at Arsenal, he’s got total dominance. The board do nothing. Arsene has a free rein. Adams has also accused Wenger of having no friends in England and of doing little to ensure that those around him on the Arsenal coaching staff are suitably rewarded for their efforts. The ex-England international added: “He’s also got a weird relationship with money. He’s on £8 million a year but Arsenal’s junior coaches are on 30 grand. “Chelsea’s coaches are on £90,000. Take seven million, Arsene, and give them all a raise. While Wenger failed to guide Arsenal to Champions League qualification for the first time in 2016-17, as they finished fifth in the Premier League, he did bring the curtain down on their campaign with a FA Cup triumph over London rivals Chelsea. Email “'Wenger would've been sacked after a year at Madrid' - Adams makes fresh dig at former boss”. Feedback on “'Wenger would've been sacked after a year at Madrid' - Adams makes fresh dig at former boss”.